As a Windows Phone developer you're, no doubt, intimately familiar with the Pivot and Panorama controls. If you've looked at porting an app that uses them from WP7.x to WP8.0 then you're probably aware that they've moved. They used to be in the Windows.Phone.Controls.dll assembly that you had to distribute with your app. They're now in the Windows.Phone.dll assembly and are already on the device. That is all relatively well documented and easy to address if you've discovered it yourself. What isn't so well documented is how the controls themselves have changed. Here you can see the default instances of the two versions of the Panorama. WP7.x on the left and WP8.0 on the right. Notice in particular the differences in the headers. 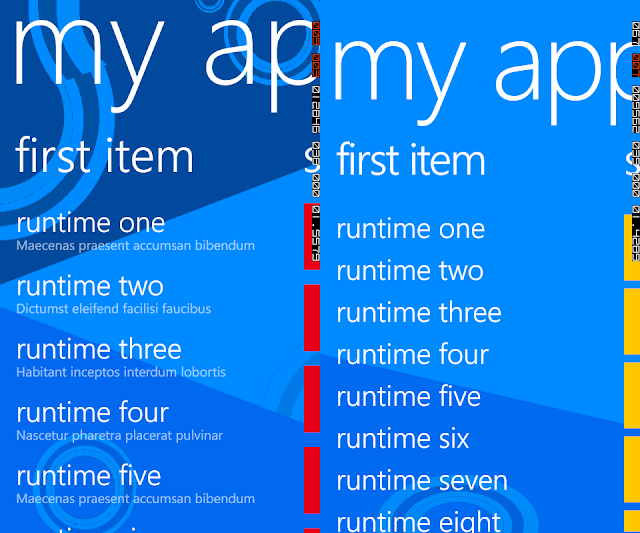 Yes, the layout (template) for the PanningTileLayer has changed in WP8.0. The item headers have been changed too. And what about the Pivot control? Well, this has changed in a much subtler way and, fortunately, is less likely to impact you. Something that is quite commonly done is to take a Pivot control and retemplate it to hide the header by removing the PivotHeadersControl from the template, to create a simple swiping control. If this is missing in WP8.0 then the page with this on will cause the app to crash when opened. There are also other ways of hiding the item header if you so wish.